Objective To summarise the benefits and harms of ischaemic conditioning on major clinical outcomes in various settings. Data sources Medline, Embase, Cochrane databases, and International Clinical Trials Registry platform from inception through October 2015. Study selection All randomised controlled comparisons of the effect of ischaemic conditioning on clinical outcomes were included. Data extraction Two authors independently extracted data from individual reports. Reports of multiple intervention arms were treated as separate trials. Random effects models were used to calculate summary estimates for all cause mortality and other pre-specified clinical outcomes. All cause mortality and secondary outcomes with P<0.1 were examined for study quality by using the GRADE assessment tool, the effect of pre-specified characteristics by using meta-regression and Cochran C test, and trial sequential analysis by using the Copenhagen Trial Unit method. Results 85 reports of 89 randomised comparisons were identified, with a median 80 (interquartile range 60-149) participants and median 1 (range 1 day-72 months) month intended duration. Ischaemic conditioning had no effect on all cause mortality (68 comparisons; 424 events; 11 619 participants; risk ratio 0.96, 95% confidence interval 0.80 to 1.16; P=0.68; moderate quality evidence) regardless of the clinical setting in which it was used or the particular intervention related characteristics. Ischaemic conditioning may reduce the rates of some secondary outcomes including stroke (18 trials; 5995 participants; 149 events; risk ratio 0.72, 0.52 to 1.00; P=0.048; very low quality evidence) and acute kidney injury (36 trials; 8493 participants; 1443 events; risk ratio 0.83, 0.71 to 0.97; P=0.02; low quality evidence), although the benefits seem to be confined to non-surgical settings and to mild episodes of acute kidney injury only. Conclusions Ischaemic conditioning has no overall effect on the risk of death. Possible effects on stroke and acute kidney injury are uncertain given methodological concerns and low event rates. Adoption of ischaemic conditioning cannot be recommended for routine use unless further high quality and well powered evidence shows benefit. Ischaemic conditioning—the induction of cyclic, non-lethal ischaemia to vascular beds around the time of the ischaemic insult—has been advocated as a means of mitigating the effects of injury including myocardial ischaemia, acute kidney injury, and stroke. It has been studied in many clinical settings, including ischaemic heart disease, stroke, cardiac surgery, transplantation, and acute kidney injury, and many potentially beneficial outcomes have been examined. The discovery of ischaemia-reperfusion injury in myocytes in 1960 led to the development of experimental models showing that myocardial infarct size could be reduced by antecedent periods of non-lethal myocardial ischaemia.1 2 This concept was then extended by reports that inducing ischaemia in remote vascular beds (such as the kidney and small bowel) and post-insult ischaemic conditioning could similarly reduce ischaemia-reperfusion injury and myocardial infarct size.3 4 5 Although the actual mechanism of any benefit remains unclear,6 it is considered a potentially useful therapy in moderating the effects of ischaemia-reperfusion injury, especially at the time of surgery, in several organs. The effect of ischaemic conditioning has been most widely studied in cardiovascular surgery, with some guidelines supporting its use during bypass surgery, but it has potential benefits in many other forms of ischaemic injury.7 Much of the evidence for benefit relies on effects on biomarkers and surrogate endpoints such as troponin and creatine kinase, rather than clinical endpoints. Trials that use clinical outcomes and are large enough to minimise false positive results are uncommon, leaving the clinical role of ischaemic conditioning unclear. We aimed to systematically review the evidence to assess whether ischaemic conditioning reduces important adverse clinical outcomes including all cause mortality and cardiovascular and renal events. 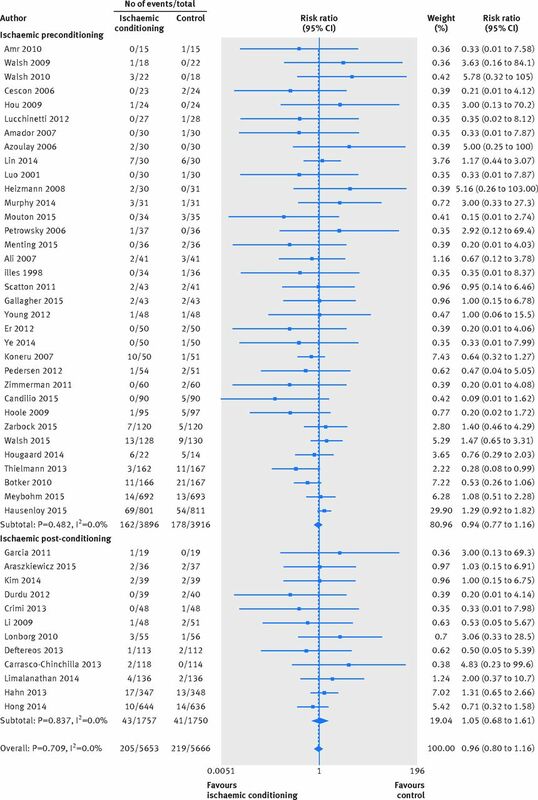 We did a systematic review of the literature according to the Preferred Reporting in Systematic Reviews and Meta-Analyses (PRISMA) guidelines.8 We identified relevant trials by using a predefined search strategy (supplementary table A) of Medline (1966 to October 2015), Embase (1980 to October 2015), the Cochrane Central Register of Controlled Trials database (Central), the International Standard Registered Clinical/social sTudy Number (ISRCTN), the International Clinical Trials Registry platform (ICTRP), and the trials listed on ClinicalTrials.gov. We also manually reviewed reference lists of relevant reports. We screened titles and abstracts initially, followed by a full text review of eligible trials. We contacted lead authors of abstracts to request additional information where needed. Randomised controlled trials that investigated the treatment effects of ischaemic conditioning on clinical outcomes in adults or children were eligible for inclusion. All permutations of ischaemic conditioning strategies were included, including central and remote ischaemic conditioning and pre-procedural and post-procedural use of the intervention. We defined central ischaemic conditioning as the direct occlusion of a major vessel supplying the organ of interest and remote ischaemic conditioning as brief periods of ischaemia applied to a limb supplying a distant vascular bed. We defined pre-procedural and post-procedural conditioning as the application of ischaemia before or after the procedure or surgery of interest. If trials used more than one modality of ischaemic conditioning, we treated them as two separate trials with the control group divided evenly.9 Eligibility was restricted to articles using English as the language of publication. Two independent investigators (LS and DH) extracted data on baseline characteristics of participants, characteristics of studies, and outcomes. Disagreements were resolved through discussions or referral to a third investigator (MJ). We assessed the methodological quality of each study by using the Cochrane Bias Methods Group tool.11 We summarised confidence in the evidence by using the Grading of Recommendations Assessment, Development and Evaluation (GRADE) system using GRADEpro GDT (supplementary table C).12 The GRADE system assesses risk of bias, imprecision, inconsistency, indirectness of study results, and publication bias (assessing each as high, moderate, low, or very low) across the body of evidence to derive an overall summary of the quality of evidence. Results are expressed as risk ratios with 95% confidence intervals obtained by a random effects model using the DerSimonian and Laird method.13 Where zero counts existed for an outcome in one arm of a trial, we added a value of 0.5 to permit meta-analysis. Where zero counts existed for an outcome in both arms of a trial, we omitted the trial from the analysis of that outcome according to Cochrane principles.11 However, we did sensitivity tests that included these trials by adding the value of 0.5 to each zero event arm,14 but we report them in this paper only if they altered the results. We used the I2 test to estimate heterogeneity across trials, with P<0.1 being considered significant. We preselected defined factors to analyse for potential heterogeneous effects on the clinical outcomes on the basis of their clinical importance for the primary outcome. These included participants’ characteristics (mean age, proportion of male patients in the study, proportion of patients with diabetes in the study, paediatric or adult population), characteristics of ischaemic conditioning (ischaemic time per cycle, central or remote stimulus, upper or lower limb stimulus, pre-procedural or post-procedural ischaemic conditioning), characteristics of procedural setting (procedure for cardiac or non-cardiac condition, surgical or non-surgical setting, specific setting, use of volatile or non-volatile anaesthetic), and characteristics of study design (sample size, follow-up period, use of placebo or sham procedure as control, use of single verse multiple criteria for diagnosis of myocardial ischaemia).10 We used meta-regression to analyse continuous variables. We analysed categorical variables by using the Cochran C test, with trials weighted with the inverse variance method (a fixed effects model). We assessed the potential for small study effects (“publication bias”) affecting the primary outcome by using the Harbord and Peters methods and depicted this graphically with a funnel plot.15 16 We applied trial sequential analysis to find the required statistical information to detect a real difference between ischaemic conditioning and control groups.17 18 We used information from our meta-analysis (effect size, prevalence of outcome, heterogeneity across studies, and variance) to calculate the heterogeneity adjusted statistical information (power=0.8; α=0.05) and used this to derive the required sample size assuming that future studies would have similar characteristics to those found in our meta-analysis. We used Stata/MP 14 and Trial Sequential Analysis 0.9 Beta (Copenhagen Trial Unit, Copenhagen, Denmark) software for statistical analyses. We identified 85 reports involving 13 800 participants. Three reports included two intervention groups and one control group,19 20 21 and one report included two intervention groups and two control groups,22 resulting in the analysis of 89 trial cohorts. The 89 trial cohorts had a median of 80 participants (interquartile range 60-149) (table 1⇓; supplementary figure A and table D). 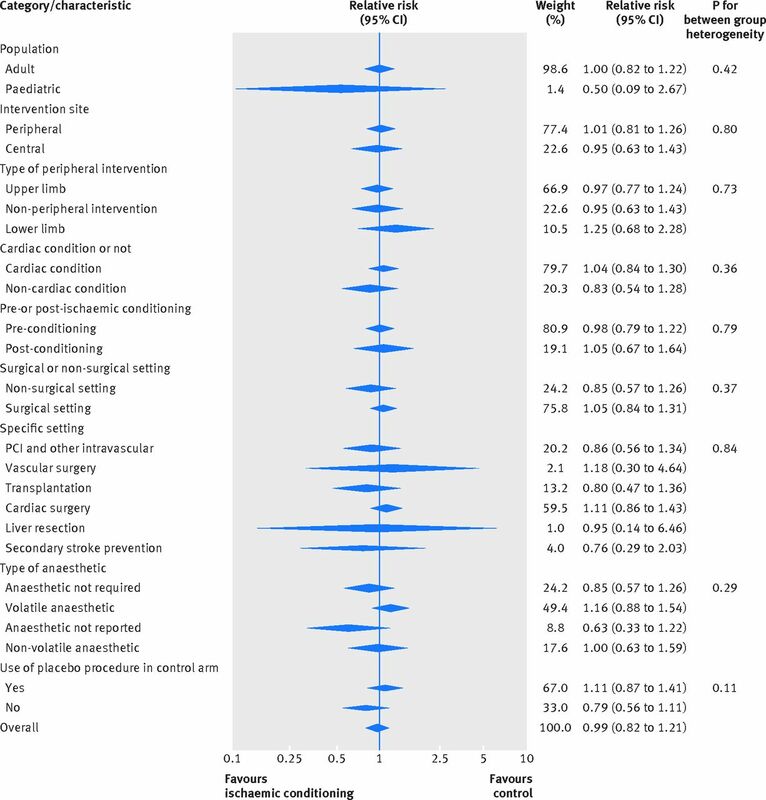 Cardiac conditions requiring surgery (43 trials) was the most common clinical setting, followed by percutaneous coronary interventions (21 trials). Central and remote ischaemic conditioning were investigated in 32 (36%) and 57 (64%) trials respectively. Pre-conditioning and post-conditioning were investigated in 68 (76%) and 21 (24%) trials respectively. Of the 65 trials conducted in settings requiring anaesthesia, volatile anaesthetic agents were used in 34 (54%), non-volatile agents were used in 13 (20%), and the type of agent was not reported in 17 (26%). A placebo procedure was performed in the control arm in 49 (55%) trials. Intended duration of follow-up was not specified in five trials, and the remainder were designed for a median duration of one month (range 1 day to 72 months). Trials were assessed as being at high or unclear risk of bias for 27-69% of evaluated trial quality parameters (supplementary figure B). 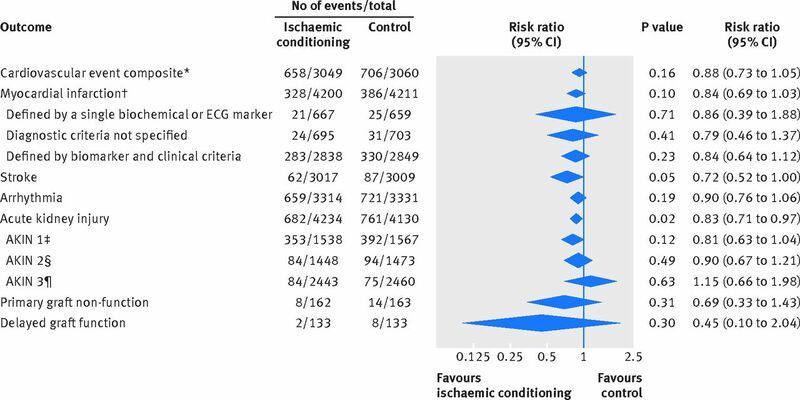 Ischaemic conditioning did not affect the risk of all cause mortality (68 trials; 11 619 participants; 424 events; risk ratio 0.96, 95% confidence interval 0.80 to 1.16; P=0.68), with moderate quality evidence according to GRADE assessment (fig 1⇓; supplementary table C). Ischaemic conditioning may reduce the risk of acute kidney injury (36 trials; 8493 participants; 1443 events; risk ratio 0.83, 0.71 to 0.97; P=0.02), with low quality evidence according to GRADE assessment. When we analysed these results according to the stricter AKIN classification, the effect seemed to diminish with increasing severity of acute kidney injury (fig 2⇑; supplementary figures F1-4; supplementary table C). Ischaemic conditioning did not reduce the risk of arrhythmias (27 trials; 6689 participants; 1380 events; risk ratio 0.90, 0.76 to 1.06; P=0.19) or transplant function: primary graft non-function (six trials; 426 participants; 22 events; risk ratio 0.69, 0.33 to 1.43; P=0.31) and delayed graft function (four trials; 266 participants; 10 events; risk ratio 0.45, 0.10 to 2.04; P=0.30) (fig 2⇑; supplementary figures G-I). For the primary outcome of all cause mortality and myocardial infarction, we found no suggestion of benefit across any of the pre-defined subgroups. There was a suggestion of increased benefit for ischaemic conditioning in non-surgical settings for stroke and acute kidney injury. Trials of proximal compared with distal ischaemic conditioning protocols were more likely to report a benefit for acute kidney injury. We found no evidence that trial quality parameters increased the likelihood of benefit being reported for ischaemic conditioning, with the exception of smaller sample size (figures 3-6⇓; supplementary table E). No statistical evidence of small study bias generally existed, although we found ambiguous results for stroke (no evidence of bias according to Harbord’s modified test (P=0.68) but evidence according to Peters’ test (P=0.01)) (supplementary table F; supplementary figure J). Trial sequential analysis incorporating the characteristics of the currently reported trials, such as heterogeneity found among studies, showed that to confirm the relevant effect sizes seen in this analyses as true estimates of effect, future trials would need to include approximately a further 18 000 mortality events, 1400 myocardial infarctions, 650 strokes, and 980 episodes of acute kidney injury. Assuming that event rates were similar to those of existing trials, such an exercise would require the enrolment of an additional 490 000 participants for the total evidence to be powered to conclusively show a benefit for mortality, 17 000 to show a benefit for myocardial infarction, 25 000 to show a benefit for stroke, and 6200 to show a benefit for acute kidney injury. These results are novel in the aggregation of data from many clinical settings, but the importance of this approach is seen in the effective ruling out of the possibility of a detectable mortality benefit from ischaemic conditioning. In addition, it highlights the remaining uncertainty about the potential benefit for the outcomes of myocardial infarction, stroke, and acute kidney injury, such that these outcomes clearly need to be the focus of future work. The ongoing 61 recruiting trials of ischaemic conditioning registered on the International Clinical Trials Registry Platform will increase the number of study participants by 4270 if completed as planned. Our trial sequential analysis shows that, assuming these ongoing trials record the same event rates as the published trials, they will recruit only two thirds of the additional participants needed to provide future meta-analyses with the power to confirm the benefit observed for acute kidney injury and an even smaller proportion of the number required to confirm a benefit for stroke or myocardial infarction. Despite many more combined major adverse cardiovascular events being available for analysis than for the individual components (stroke, myocardial infarction), the summary effect for this outcome was smaller than the individual components. The combined cardiovascular events analysis is dominated by recent large, high quality trials, whereas the effects for the individual components of myocardial infarction and stroke were mostly generated by reports from smaller trials. In addition, definitions of these individual outcomes were variable or not available, and adjudication was not routinely performed, potentially increasing the risk of bias with the individual components compared with the combined cardiovascular events outcome. Our ability to examine overall heterogeneity for some outcomes, including mortality, was limited by the large number of small trials with few events and wide confidence intervals. Nevertheless, it provides additional insights that may inform the design of future studies. Trials that did not use a placebo procedure in the control arm were more likely to report benefit, further suggesting that the existing literature might overstate benefits. We saw indications of greater benefit in non-surgical trials compared with surgical trials, at least for stroke and acute kidney injury. Whether this reflects a true but weak effect that is overwhelmed by the effect of the larger surgical insult or a false positive finding is not immediately clear. However, the use of volatile or non-volatile anaesthetic agents did not affect the likelihood of benefit, contrary to previous hypotheses.25 26 Generally, the characteristics of the intervention did not affect the likelihood of benefit from the intervention, with the possible exception of benefit for acute kidney injury in trials that used central compared with peripheral ischaemic conditioning. This systematic review and meta-analysis encompasses the full range of clinical settings in which ischaemic conditioning trials have been conducted. Previous reviews have focused on specific settings, most prominently that of cardiac conditions requiring surgery. A recent review examining the effects of remote ischaemic conditioning on myocardial injury biomarkers and clinical outcomes in a meta-analysis of 44 clinical trials found lower incidence rates for myocardial infarction, major cardiac and cerebrovascular events, and all cause mortality but included markedly fewer outcome events than did our analysis,27 and it lacked the benefit of being able to include the recently published, higher quality, large scale trials.28 29 A meta-analysis of 23 trials found no effect on perioperative myocardial infarction (risk ratio 0.69, 0.34 to 1.4) or 30 day mortality (0.91, 0.43 to 1.95).30 The effects of ischaemic conditioning on acute kidney injury are also conflicting. Recent meta-analyses have found borderline effects on the risk of acute kidney injury with remote ischaemic conditioning, but the authors urged caution owing to the widely discrepant definitions used for this outcome.31 32 More broadly, the totality of the evidence summarised for the first time in this systematic review does not provide clear evidence for the benefits of this intervention. This review included all randomised trials assessing ischaemic conditioning across different delivery strategies and durations in various settings in both adult and paediatric populations. Despite this variation in clinical settings, the biological premise is consistent across these studies—that periods of controlled ischaemia mitigate the severity of injury from pathological ischaemic events. Bringing this data together allows greater precision of estimates of effect but also introduces potential heterogeneity that may cloud the findings. The absence of significant statistical heterogeneity supports this approach, is an important finding itself, and is presented to guide the design of further trials. Some readers may be more interested in potential effects within certain populations and settings or with specific modalities of the intervention. The analyses include these results, although they are inherently of lower power than the overall conclusions. Conclusions drawn from the analyses must additionally be tempered by the heterogeneity of study quality and endpoint definitions, along with the awareness that the pre-specified sources of heterogeneity could not be tested in many trials. The trial sequential analyses are premised on the assumptions that the trial pool contributing to future meta-analyses would have similar characteristics to the current trial pool. While we await the results of future trials, this sum of evidence does not support a clinically significant effect of ischaemic conditioning on all cause mortality. Ischaemic conditioning may reduce myocardial ischaemia, stroke, and acute kidney injury, although the lack of effect on the composite outcome of major adverse cardiovascular events and attenuation of the acute kidney injury benefit with increasing outcome severity, along with the risk that existing studies have overestimated these potential benefits, raise questions about the true effects on clinical outcomes. Further high quality trials examining the effect of ischaemic conditioning on myocardial ischaemia, stroke, and acute kidney injury, particularly in non-surgical settings, are warranted. In the meantime, the current evidence does not warrant adoption into routine clinical practice. Contributors: VP, MG and MJ were responsible for the study concept. LS, SVB, MW, MG, and MJ were responsible for study design. SVB was responsible for the literature search. LS and MGH were responsible for study selection. LS and DH were responsible for data extraction. MJ and KR were responsible for statistical analysis. LS, DH, MGW, SVB, KR, MW, VP, XY, GSH, MG, and MJ were responsible for data analysis and interpretation. MG, MJ, and LS were responsible for drafting the manuscript. LS, DH, MGW, SVB, KR, VP, XY, GSH, MG, and MJ were responsible for critical revision of the manuscript. MG is the guarantor. Funding: There was no specific funding source for this study. LS was supported by an Australian postgraduate award and a George Institute for Global Health postgraduate scholarship. DH is supported by a Youth Science and Technology Creative Research Groups of Sichuan Province scholarship. VP is supported by a senior research fellowship from the National Health and Medical Research Council of Australia. MGW was supported by a new investigator award from the Canadian Institutes of Health Research. MJ was supported by a career development fellowship from the National Health and Medical Research Council of Australia and by the National Heart Foundation. Competing interests: All authors have completed the ICMJE uniform disclosure form at www.icmje.org/coi_disclosure.pdf (available on request from the corresponding author) and declare: no support from any organisation for the submitted work other than that described above; no financial relationships with any organisations that might have an interest in the submitted work in the previous three years; no other relationships or activities that could appear to have influenced the submitted work [or describe if any]..
Jennings RB, Sommers HM, Smyth GA, Flack HA, Linn H. Myocardial necrosis induced by temporary occlusion of a coronary artery in the dog. Arch Pathol1960;70:68-78.pmid:14407094. Murry CE, Jennings RB, Reimer KA. Preconditioning with ischemia: a delay of lethal cell injury in ischemic myocardium. Circulation1986;74:1124-36. doi:10.1161/01.CIR.74.5.1124 pmid:3769170. McClanahan T, Nao B, Wolke L, Martin BJ, Mezt TE. Brief renal occlusion and reperfusion reduces myocardial infarct size in rabbits. FASEB J1993;7:A118. Gho BC, Schoemaker RG, van den Doel MA, Duncker DJ, Verdouw PD. Myocardial protection by brief ischemia in noncardiac tissue. Circulation1996;94:2193-200. doi:10.1161/01.CIR.94.9.2193 pmid:8901671. Zhao ZQ, Corvera JS, Halkos ME, et al. Inhibition of myocardial injury by ischemic postconditioning during reperfusion: comparison with ischemic preconditioning. Am J Physiol Heart Circ Physiol2003;285:H579-88. doi:10.1152/ajpheart.01064.2002 pmid:12860564. Hausenloy DJ, Yellon DM. Remote ischaemic preconditioning: underlying mechanisms and clinical application. Cardiovasc Res2008;79:377-86. doi:10.1093/cvr/cvn114 pmid:18456674. Hillis LD, Smith PK, Anderson JL, et al. American College of Cardiology Foundation American Heart Association Task Force on Practice Guidelines American Association for Thoracic Surgery Society of Cardiovascular Anesthesiologists Society of Thoracic Surgeons. 2011 ACCF/AHA Guideline for Coronary Artery Bypass Graft Surgery. A report of the American College of Cardiology Foundation/American Heart Association Task Force on Practice Guidelines. Developed in collaboration with the American Association for Thoracic Surgery, Society of Cardiovascular Anesthesiologists, and Society of Thoracic Surgeons. J Am Coll Cardiol2011;58:e123-210. doi:10.1016/j.jacc.2011.08.009 pmid:22070836. Moher D, Liberati A, Tetzlaff J, Altman DG. PRISMA Group. Preferred reporting items for systematic reviews and meta-analyses: the PRISMA statement. Ann Intern Med2009;151:264-9, W64. doi:10.7326/0003-4819-151-4-200908180-00135 pmid:19622511. Higgins J, Green S. Cochrane handbook for systematic reviews of interventions. Version 5.1.0.Cochrane Collaboration, 2011. Thygesen K, Alpert JS, Jaffe AS, et al. Joint ESC/ACCF/AHA/WHF Task Force for the Universal Definition of Myocardial Infarction. Third universal definition of myocardial infarction. Circulation2012;126:2020-35. doi:10.1161/CIR.0b013e31826e1058 pmid:22923432. Kaltenbach JP, Jennings RB. Metabolism of ischemic cardiac muscle. Circ Res1960;8:207-13. doi:10.1161/01.RES.8.1.207 pmid:14404191. Earle DP, Jennings RB. Focal glomerular lesions. Trans Am Clin Climatol Assoc1960;72:24-37.pmid:13725495. Friedrich JO, Adhikari NK, Beyene J. Inclusion of zero total event trials in meta-analyses maintains analytic consistency and incorporates all available data. BMC Med Res Methodol2007;7:5. doi:10.1186/1471-2288-7-5 pmid:17244367. Simkhovich BZ, Hale SL, Ovize M, Przyklenk K, Kloner RA. Ischemic preconditioning and long-chain acyl carnitine in the canine heart. Coron Artery Dis1993;4:387-92. doi:10.1097/00019501-199304000-00011 pmid:8261212. Przyklenk K, Bauer B, Ovize M, Kloner RA, Whittaker P. Regional ischemic ‘preconditioning’ protects remote virgin myocardium from subsequent sustained coronary occlusion. Circulation1993;87:893-9. doi:10.1161/01.CIR.87.3.893 pmid:7680290. Wetterslev J, Thorlund K, Brok J, Gluud C. Trial sequential analysis may establish when firm evidence is reached in cumulative meta-analysis. J Clin Epidemiol2008;61:64-75. doi:10.1016/j.jclinepi.2007.03.013 pmid:18083463. Brok J, Thorlund K, Wetterslev J, Gluud C. Apparently conclusive meta-analyses may be inconclusive--Trial sequential analysis adjustment of random error risk due to repetitive testing of accumulating data in apparently conclusive neonatal meta-analyses. Int J Epidemiol2009;38:287-98. doi:10.1093/ije/dyn188 pmid:18824466. Lavi S, D’Alfonso S, Diamantouros P, et al. Remote ischemic postconditioning during percutaneous coronary interventions: remote ischemic postconditioning-percutaneous coronary intervention randomized trial. Circ Cardiovasc Interv2014;7:225-32. doi:10.1161/CIRCINTERVENTIONS.113.000948 pmid:24692535. Wu Q, Gui P, Wu J, et al. Effect of limb ischemic preconditioning on myocardial injury in patients undergoing mitral valve replacement surgery. -A randomized controlled trial-. Circ J2011;75:1885-9. doi:10.1253/circj.CJ-10-1130 pmid:21697609. Luo W, Zhu M, Huang R, Zhang Y. A comparison of cardiac post-conditioning and remote pre-conditioning in paediatric cardiac surgery. Cardiol Young2011;21:266-70. doi:10.1017/S1047951110001915 pmid:21262079. Kottenberg E, Thielmann M, Bergmann L, et al. Protection by remote ischemic preconditioning during coronary artery bypass graft surgery with isoflurane but not propofol - a clinical trial. Acta Anaesthesiol Scand2012;56:30-8. doi:10.1111/j.1399-6576.2011.02585.x pmid:22103808. Zeng X, McMahon GM, Brunelli SM, Bates DW, Waikar SS. Incidence, outcomes, and comparisons across definitions of AKI in hospitalized individuals. Clin J Am Soc Nephrol2014;9:12-20. doi:10.2215/CJN.02730313 pmid:24178971. Garg AX, Devereaux PJ, Yusuf S, et al. CORONARY Investigators. Kidney function after off-pump or on-pump coronary artery bypass graft surgery: a randomized clinical trial. JAMA2014;311:2191-8. doi:10.1001/jama.2014.4952 pmid:24886787. Yu CH, Beattie WS. The effects of volatile anesthetics on cardiac ischemic complications and mortality in CABG: a meta-analysis. Can J Anaesth2006;53:906-18. doi:10.1007/BF03022834 pmid:16960269. Landoni G, Biondi-Zoccai GG, Zangrillo A, et al. Desflurane and sevoflurane in cardiac surgery: a meta-analysis of randomized clinical trials. J Cardiothorac Vasc Anesth2007;21:502-11. doi:10.1053/j.jvca.2007.02.013 pmid:17678775. 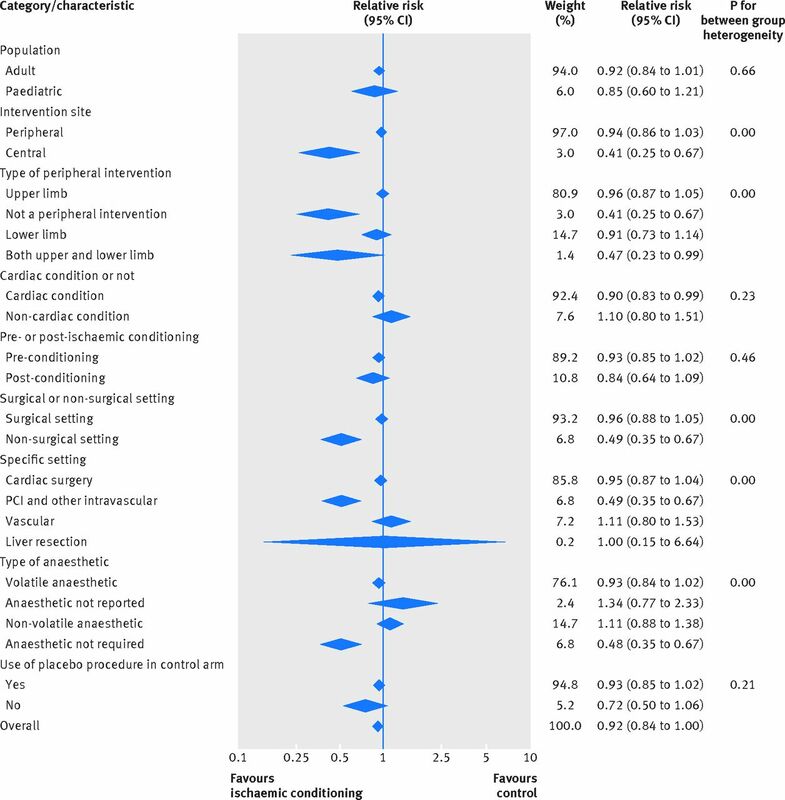 Le Page S, Bejan-Angoulvant T, Angoulvant D, Prunier F. Remote ischemic conditioning and cardioprotection: a systematic review and meta-analysis of randomized clinical trials. Basic Res Cardiol2015;110:11. doi:10.1007/s00395-015-0467-8 pmid:25653117. Meybohm P, Bein B, Brosteanu O, et al. RIPHeart Study Collaborators. A Multicenter Trial of Remote Ischemic Preconditioning for Heart Surgery. N Engl J Med2015;373:1397-407. doi:10.1056/NEJMoa1413579 pmid:26436208. Hausenloy DJ, Candilio L, Evans R, et al. ERICCA Trial Investigators. Remote Ischemic Preconditioning and Outcomes of Cardiac Surgery. N Engl J Med2015;373:1408-17. doi:10.1056/NEJMoa1413534 pmid:26436207. Healy DA, Khan WA, Wong CS, et al. 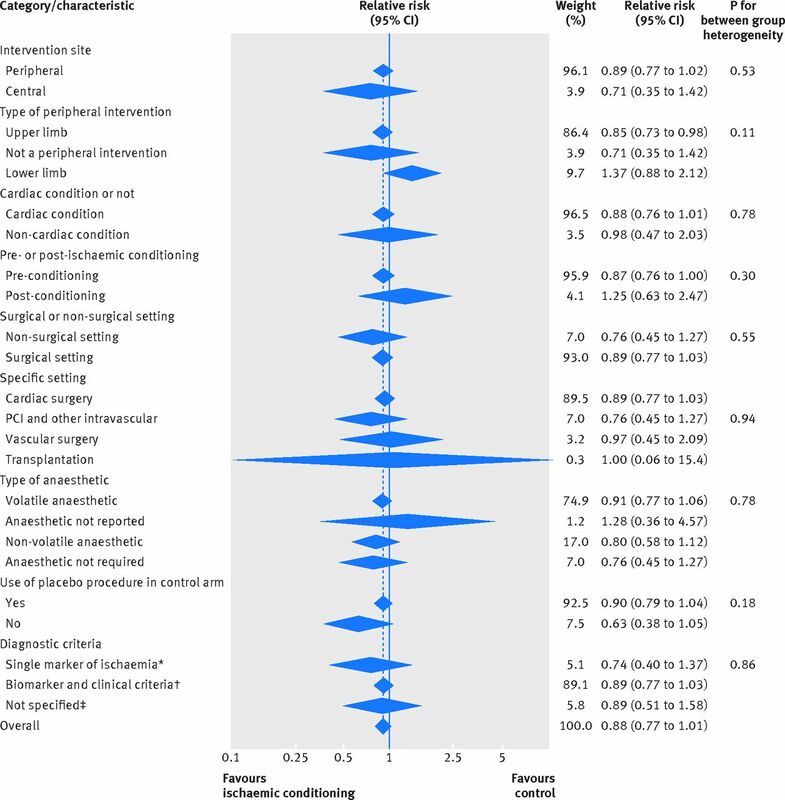 Remote preconditioning and major clinical complications following adult cardiovascular surgery: systematic review and meta-analysis (Provisional abstract). Database of Abstracts of Reviews of Effects2014;2:20-31. Yang Y, Lang XB, Zhang P, Lv R, Wang YF, Chen JH. 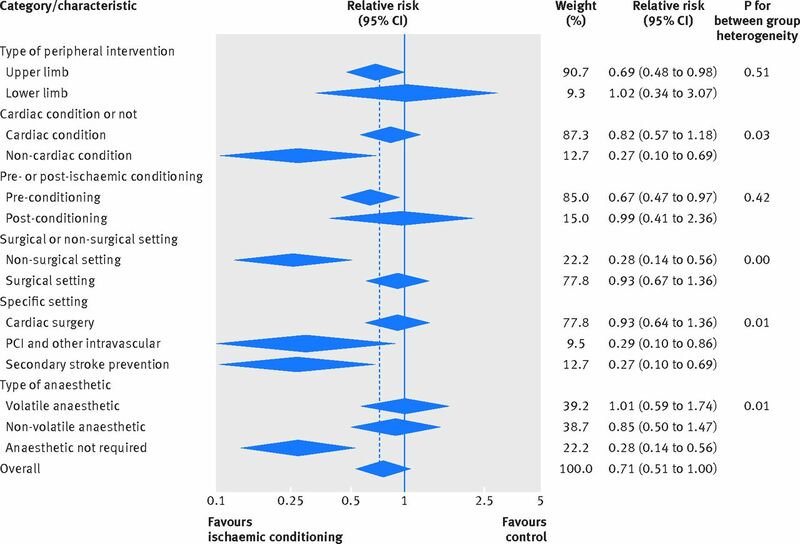 Remote ischemic preconditioning for prevention of acute kidney injury: a meta-analysis of randomized controlled trials. Am J Kidney Dis2014;64:574-83. doi:10.1053/j.ajkd.2014.04.029 pmid:24954246. Zhao B-C, Deng W-T, Li B-C, et al. Remote ischemic preconditioning for preventing acute kidney injury following cardiovascular surgery: A meta-analysis with trial sequential analysis. Int J Cardiol2016;203:842-4. doi:10.1016/j.ijcard.2015.11.081 pmid:26599748.